As the world faces the biggest global migration crisis since World War II, the EU and its member states are deploying vast resources to prevent the arrival of refugees and migrants to Europe. After successfully closing down key migration routes — the Western Mediterranean route from Morocco and Senegal to Spain, the Aegean route from Turkey to Greece, and the Balkan route from Greece to Germany— EU governments are now looking at the Central Mediterranean route, with Libya the main point of departure and Italy the point of arrival for many of those hoping to start a new life. 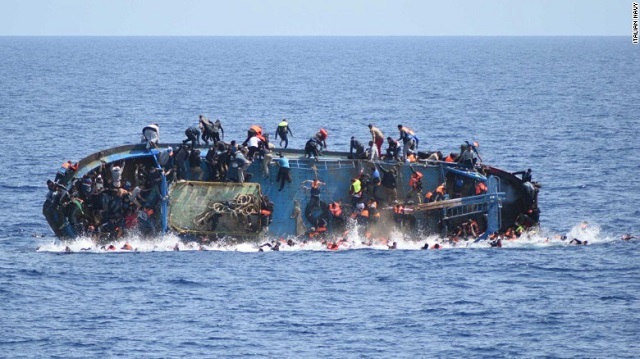 The Central Mediterranean route is the most dangerous route in the world; 2,158 deaths have been recorded between January and June this year by the International Organization for Migration. As of August 6, 116,692 people had entered Europe by sea this year alone, with more than 80 per cent of them landing in Italy and the remainder on the shores of Greece, Cyprus and Spain. The arrival of thousands of refugees and migrants in Italy has overwhelmed the country’s reception system and encouraged a bitter political debate. The Italian government has recently described the situation as unsustainable and voiced its intention to take measures against this. While calling on its fellow EU member states to share responsibility towards the management of migration flows, Italy has accused non-governmental organizations (NGOs) that have been carrying out Search and Rescue (SAR) operations in the Mediterranean of colluding with human smuggling networks, and encouraging refugees and migrants to make the sea crossing by providing them with a safety net during their journey. In July, the Italian minister of interior, Marco Minniti, issued a behavioural code of conduct to regulate the activities of NGOs carrying out SAR operations, despite a voluntary code already being in operation. A ban on the entry of NGOs into Libyan waters. An obligation to take rescued people to a safe harbour and not to make trans-shipments on other vessels. An obligation to receive on board judicial police officers for investigations related to human trafficking. Several NGOs have refused to sign the code, citing that it interfered with their independence and humanitarian principles, and demanding clarity on whether the code is aimed at fighting human smuggling networks or, rather, preventing refugees and migrants from arriving in Europe. Indeed, according to Human Rights Watch (HRW), the code of conduct could increase the number of refugees and migrants dying at sea. The requirement that NGO vessels take refugees and migrants to a safe port, rather than transferring them to other vessels, would prevent them from conducting further activities in SAR areas. As Judith Sunderland, associate Europe and Central Asia director at HRW, put it, “NGOs are out there in the Mediterranean rescuing people because the EU is not. Given the scale of tragedies at sea and the horrific abuses migrants and asylum seekers face in Libya, the EU should work with Italy to enhance robust search and rescue in the waters off Libya, not limit it”. A study of mixed refugee and migrant flows commissioned in October 2016 by the UN High Commissioner for Refugees has found that refugees and migrants in Libya face a level of instability, economic difficulties, exploitation and abuse that force them to flee to Europe. The lack of security and rule of law also pushes them to attempt the journey to Europe. A UN Security Council report of April 2017 has highlighted that refugees and migrants in Libya “are subjected to torture, forced labour and sexual exploitation at the hands of smugglers, traffickers, members of armed groups and security forces, including the Libyan coastguard”. Libya has not ratified the Refugee Convention and does not have a functioning asylum system. Despite Libya’s ongoing political instability and poor human rights records, including the proven collusion of the Libyan coastguard with local militias, the Italian parliament voted in August in favour of deploying warships in Libyan waters to support its agents in the interception and return of refugees and migrants to Libya. NGOs and scholars have criticized the plan, saying that it could lead to the detention of refugees and migrants in Libya, and their exposure to the risk of torture, sexual violence and forced labour. “If the objective is to stem the flow of people crossing the sea, no matter if they are fleeing persecution or human rights violations, then the deployment seems to be having some impact. Unfortunately, the side effects of it is that more people are trapped in Libya or die on land due to the (partial) closure of the route”, Nando Sigona, senior lecturer at the University of Birmingham told me. Under international law all states, including Italy, have an obligation to respect people’s right to seek asylum, and not to return them to the frontiers of territories where their life or freedom would be threatened (the so-called ‘principle of non-refoulement’). Italy’s decision to support the Libyan coastguard is consistent with an overall EU strategy to delegate to Libya the responsibility of preventing migration to Europe. It is within this framework that in August the Libyan navy restricted humanitarian vessels’ access to the international waters off the Libyan coast, forcing at least four NGOs to interrupt their SAR operations. Unsurprisingly, the Italian foreign minister Angelino Alfano has celebrated the announcement as a sign that Libya is ready to work with Europe to reduce migration flows. The Italian government’s actions evoke its approach a decade ago, at the height of its cooperation on migration with the Gaddafi government, when Italy was pushing back migrant boats to Libya in clear violation of international law (in February 2012, the Grand Chamber of the European Court of Human Rights condemned Italy for its infringement of the principle of non-refoulement). In addition to violating the human rights of refugees and migrants, and putting their lives at further risk, the recent steps taken by Italy do not offer a long-term strategy for the management of migration flows. And yet, there is a need to come up with a different approach of responding to the irregular crossing of the Mediterranean Sea, including by tackling the root causes of migration and ending the abuses against refugees and migrants in Libya so that they are not forced to rely on smuggling networks to make deadly journeys. As noted by Sigona, “safe and legal routes to Europe would help to empty the market for smugglers, while guaranteeing a more orderly and manageable mobility. If Europe closes the door to refugees, people will be forced to take more dangerous routes and to endanger their lives”. It is high time for Europe to stop turning a blind eye to the human tragedy unfolding on its doorstep.